The Chuck Norris of Star Wars. He stole the Death Star plans before Jyn Erso. He stopped the Dark Trooper Project. Stormtrooper. Mercenary. Jedi. Master. There’s an entire galaxy of characters and adventures beyond Luke, Leia, Han, Rey, Finn, Darth Vader, Boba Fett, and the other faces that dominate the Star Wars films. Who in the Galaxy is That? profiles individual characters from the Star Wars universe—from the films, book, comics, and games. From favorite supporting characters to interesting creatures lurking in the background, if you’ve ever asked “hey, who’s that?” Who in the Galaxy is That? strives to tell you. Kyle Katarn is the Chuck Norris of Star Wars. Courtesy of Decipher. While Luke Skywalker is the poster boy for both the Rebel Alliance and the Jedi, Kyle Katarn operates behind the scenes, facing down just as many threats on a parallel journey of self-exploration in the Force along the path to becoming a Jedi Knight. The similarities between Katarn and Skywalker reach back to childhoods farming, a lifestyle despoiled for both by the murder of their parents, incidents that propell both men off their farms and into space to take up arms in the Galactic Civil War. While Skywalker has the guidance of Obi-Wan Kenobi to point him toward the unmuddied evidence of the Empire murdering his surrogate parents, Uncle Owen and Aunt Beru Lars, Katarn initially blames the Rebel Alliance for the slaughter of his family. Born on a moon of the Rim world Sullust, Katarn seeks an education in one of the few opportunities available to him—the Imperial Academy on Carida. 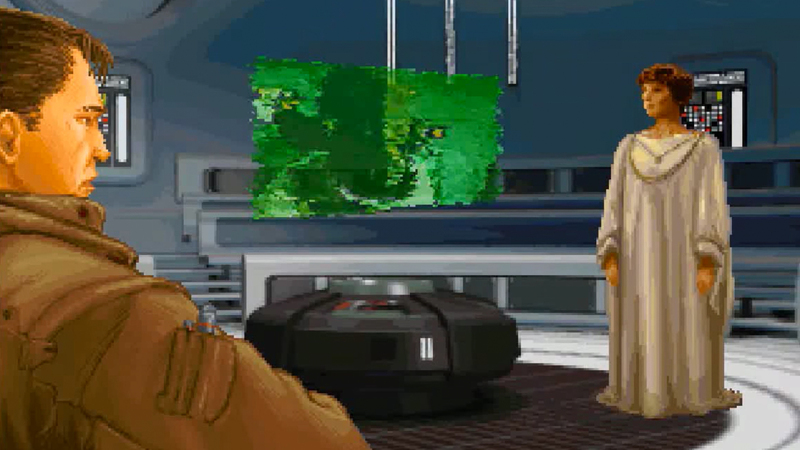 Kyle Katarn discovers his Jedi nature. Courtesy of LucasArts/Disney. 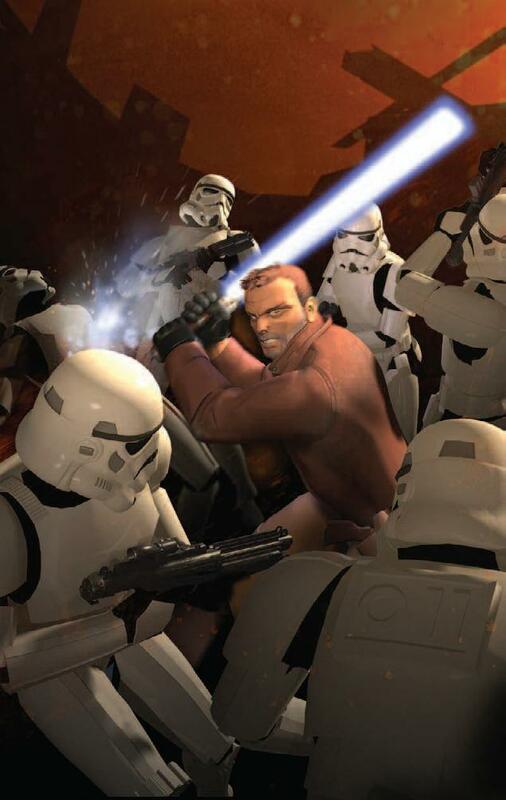 For his Omega Exercise, a practical, real-fire mission final exam designed to measure a cadet’s leadership potential and effectiveness under pressure, Katarn is place in charge of a strike team raiding a Rebel encampment on a nearby asteroid. 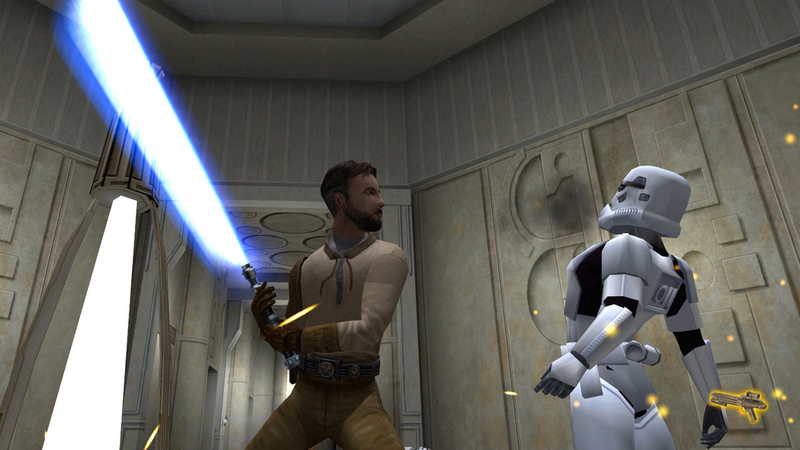 During the hazardous mission, Katarn experiences premonitions that hint at heretofore unknown Force sensitivity. His intuitions save the lives of the men under his command. 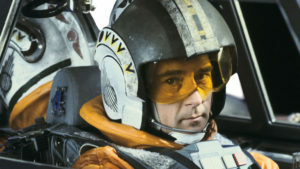 They also inspire him to spare the life of smuggler and Rebel agent Jan Ors, as well as the lives of others on the base. Katarn’s success at routing the Rebels with minimal losses from his platoon earn him not only graduation from the Imperial Academy as a Stormtrooper, but also immediate decoration and promotion to officer. His joy instantly sours, however, at the simultaneous news of his father’s murder on their family farm on the agricultural moon Sulon. The Rebel Alliance raided Sulon, killing the senior Katarn in the process. Kyle’s mother died some time before, a victim of faulty farming equipment. The loss of his father to the Rebellion leaves Katarn without family; the Empire is there as substitute family. Katarn need only hate the Rebel Alliance, which he now does. Kyle Katarn meets Mon Mothma. Courtesy of LucasArts/Disney. While on a pleasure crusie to clear his mind of grief before his first assignment under Imperial commission, Katarn encounaters Jan Ors a second time. She shows him smuggled holorecordings of the attack on Sulon revealing that the true aggressors—and murders of his father—were Imperial troops flying ships painted with Rebel Alliance insignia. Despite the troops disguises, there tactics are blatantly obvious to the new Imperial Academy graduate. Katarn defects to the Alliance, becoming a spy at the direct behest of Mon Mothma. His first mission in this role is the first-person shooter video game, Star Wars: Dark Forces , which, like all of Katarn’s adventures, playable and prose, were official Star Wars canon until being declared unofficial to make way for new film storytelling. Indeed, Katarn’s role in Star Wars canon is undoubtedly a leading reason for the reclassification of the Star Wars Expanded Universe as non-canon. Katarn, you see, was the one who stole the plans to the Death Star. That first mission Katarn undertakes on behalf of the Rebellion is to the planet Danuta. Success results in his possession of the Death Star plans, which are delivered, indirectly, to Princess Leia. Kyle Katarn is therefore erased by, and to make room for, the events of Rogue One: A Star Wars Story , which sees Jyn Erso steal the plans to the Death Star. 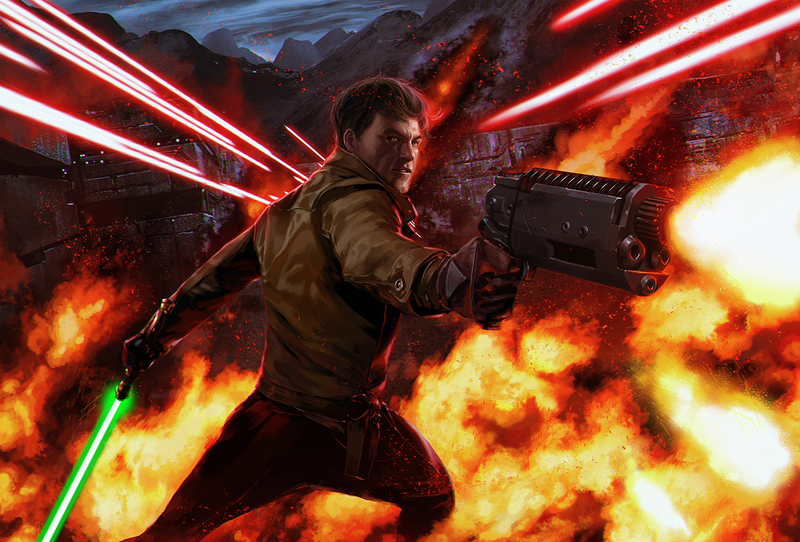 Agent of the Empire Kyle Katarn becomes an agent of the Rebellion. Courtesy of LucasArts/Disney. Katarn’s playable adventures continue through four more games with stories that were also canon and often mentioned in more mainstream Star Wars media such as comics and novels. His thwarting of the Empire’s own super-soldier bid, the Dark Trooper project, as well as his encounters with previously hidden Dark Jedi, became the stuff of legend in the Star Wars universe. Throughout all of it he maintains a partnership with Jan Ors. Following Dark Forces, in the sequel, Star Wars: Jedi Knight: Dark Forces II , and three Star Wars: Jedi Knight games after that, Katarn begins taking note of a growing sensitivity to, and ability within, the Force. 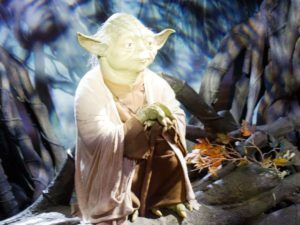 This sets him on the aforementioned odyssey that would see him become a Jedi Knight, one that often mirrors Luke Skywalker’s journey, though Katarn comes closer, and more often, to a fall to the Dark Side than Skywalker’s brief but traumatic visit to the Cave of Evil on Dagobah. Fans looking to follow the adventures of this exciting and complex character without playing the video games can listen to a fully dramatized radio play of his adventures in Star Wars: Dark Forces . Kyle Katarn, Jedi Knight. Courtesy of LucasArts/Disney. Eventually, Katarn joins Skywalker’s new Jedi Academy, becoming at various times student and teacher, including as both to Mara Jade. Katarn earns the rank of Jedi Master and is appointed to the Masters’ Council in time to take an active role defending the galaxy from the extra-galactic invaders, the Yuuzhan Vong, as chronicled in the New Jedi Order series of novels, novellas, and short stories. Later, exploring his Jedi nature, he constructs and uses a lightsaber in addition to, and often in place of, a blaster sidearm. He flies a CEC HWK-290 dubbed the Moldy Crow. 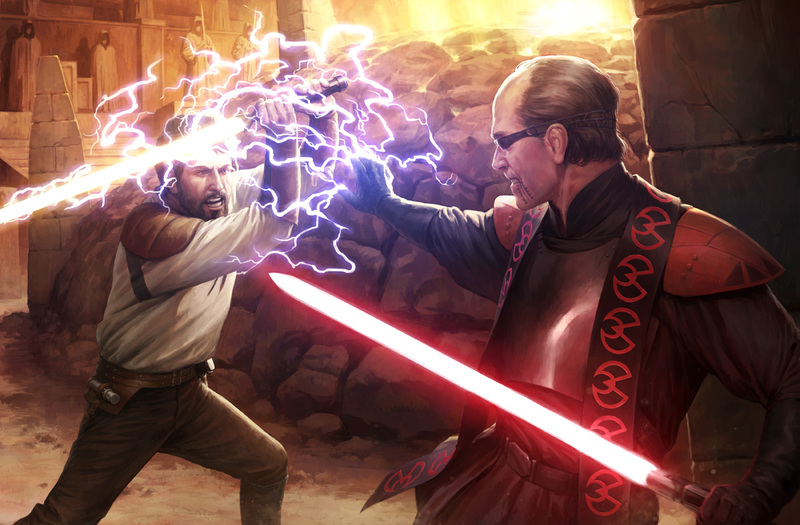 Kyle Katarn duels the Dark Jedi Jerec. Courtesy of LucasArts/Disney. What in the Galaxy are those Symbols? Throughout Who in the Galaxy is That? profiles you may encounter one or more of the following symbols. 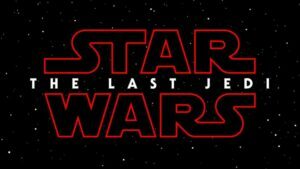 Sources and media cited as canon contain information that is officially part of the Star Wars film universe, which also includes non-film media such as books, comic books, games, and more. This means the information is officially part of the history of Star Wars that appears in the films. It came from, or may appear within or influence, the events of a Star Wars film. Following Return of the Jedi, George Lucas stated that he would not make other Star Wars movies. He then opened Star Wars to other creators and media. Carefully overseen by Lucas’s company, Lucas Arts, hundreds of new Star Wars novels, comic books and graphic novels, video games, and television shows were created to expand the Star Wars universe and tell stories in all directions—from thousands of years before Luke Skywalker was born to thousands of years after, from filling in the histories of the greatest Star Wars legends to bringing life to every background alien in the Cantina scene. This was the Star Wars Expanded Universe, and it was all canon until new Star Wars films were once again possible. Disney and Lucas Arts then found themselves penned in by the massive amount of material from other creators and projects. They simply couldn’t make Episode VII and beyond because every moment in the lives of the major characters of Han, Luke, Leia, and others had already been chronicled in the Expanded Universe, and very little of that could easily be translated to feature films easily followed by, and appealing to, the many different types of Star Wars fans who loved the Original Trilogy. 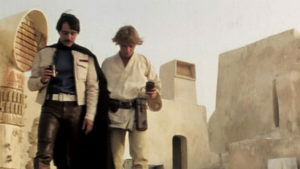 As a result, a large portion of the formerly-canon Expanded Universe stories were declared non-canon, unofficial in terms of the film continuity. The stories still exist and continue to expand, but now in an alternate reality called Star Wars Legends while other new stories are created alongside them within the universe of the films. Though rare, you’ll see this symbol appear from time-to-time in Who in the Galaxy is That? 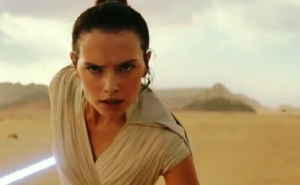 Star Wars fans are many and varied, and they like to create their own movies, stories, comics, artwork, and more based in the Star Wars universe. Occasionally, a fan-created work is so good and becomes so popular that it gains super star status all on its own. When such rarities relate to the characters profiled in Who in the Galaxy is That?, they are identified by the Fandom-Created symbol. Have you ever wondered, “who in the galaxy is that?” Tell us in the comments who you’ve wondered about in the Star Wars universe of films, books, comics, games, and even toys. If you know the character’s name, tell us, but if you don’t know a name, tell us where we can find the character that has piqued your curiosity. 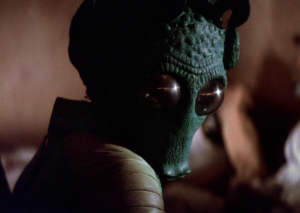 Something like “the third bounty hunter from the left in the Star Destroyer scene in Empire Strikes Back” works quite well in directing us to who you’re thinking about. Whomever you wonder about, we might just profile in Who in the Galaxy is That? Pariah Burke is a writer, consultant, and book author based on Earth, the third planet in the Sol System, outside the Portland, Oregon spaceport, with his own Princess Leia and Jaina Solo. Pariah would definitely shoot first.